Windows 8.1 is Microsoft's chance to regain the goodwill lost in the contentious release of the new-look Windows 8 operating system—and by and large, the feature-packed re-do smooths out the OS's more onerous rough edges. (Boot to desktop, and a better Windows Store? Yes, please!) Sure, Windows 8.1's improvements are more about refinement than revolution, but this is an update, not a whole new OS. While Windows 8.1's new apps and hidden features should leave you mostly sated if you've already bought into Microsoft's modern-style vision of the future, the update still isn't…quite…perfect. In fact, after spending more than a day tinkering with Windows 8.1, we can think of a dozen additions we'd love to see. With the official release of Windows 8.1 likely still months off, Microsoft has time to add these features to the update. Fingers crossed! 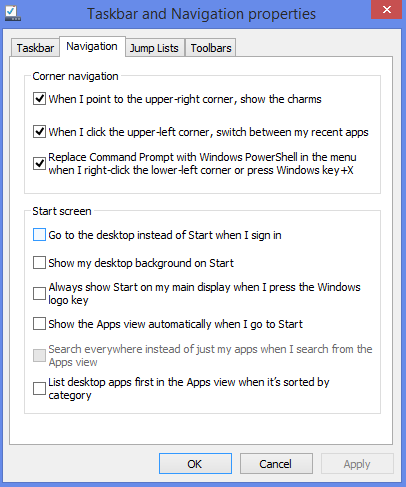 The simple return of the Start button, even in its bastardized "drop you on the Start screen" form, fixes one of the major interface woes found in the original Windows 8.0 release, especially when paired with the new All Apps button. But Microsoft shouldn't stop there. Windows 8.1 is still chock-full of hidden menus that appear only if you know the secret handshake—which corner to touch or gesture to make. Many of the most crucial system functions are buried in those elusive screens. Give us subtle visual clues for hot corners! Give us the ability to pin the Charms menu open! Drag those crucial elements into the light! These valuable options shouldn't be buried in an obscure submenu. Windows 8.1 goes a long way toward making Microsoft's revamped OS more palatable to the desktop fanatics (like me! ), but it does so grudgingly. Sure, you can shut down your PC from the new Start button, but only if you think to right-click on it and sift through a long list of administrative options. Likewise, helpful additions like the ability to boot to the desktop or have the Start button bring you to the All Apps screen are buried under a submenu found only by right-clicking on the taskbar. Really, Windows? It'd be great to see these options highlighted in the Settings charm's Personalize options, or maybe even offered as part of the initial installation process. Don't hold your breath, though: Since Microsoft has clearly tied its future to the modern UI, the desktop will be lucky if it receives benign neglect, as opposed to being eliminated entirely. Speaking of which, the Personalize section really should have many, many more options for users. You'll find only preset Start screen backgrounds and background/accent color options in Windows 8.1's Personalize screen. Microsoft should seize the opportunity to make it a one-stop DIY shop. Toss in the aforementioned desktop personalization options, screensaver and lock-screen choices (including the ability to set app notifications), the ability to swap out your profile picture, and heck, maybe even the Personalization syncing options found in the new SkyDrive submenu in the modern PC Settings. Not only would it make sense, it would make me happy. You know what's awesome? Read-it-later apps that let you save an online article to, well, read it later. You know what's even more awesome? 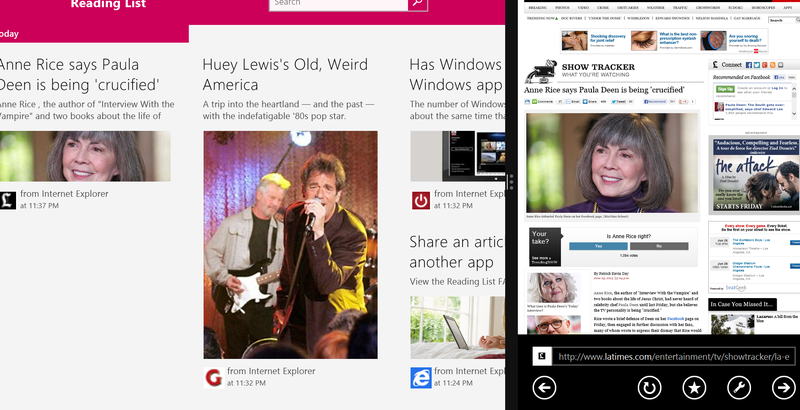 Windows 8.1 includes a read-it-later app dubbed Reading List, which is populated by articles sent using the Share charm in Internet Explorer 11. You know what's not so awesome? That Share function works only in the modern version of IE 11—not its desktop counterpart. I can haz bookmarklet? In Windows 8.1, as with plain-Jane Windows 8 before it, you can't use the modern-style version of Internet Explorer 11 whatsoever if you have a non-IE browser (like Chrome or Firefox) set as your default. That's just heavy-handed crap. I love the modern IE browser on touchscreen devices, but since Chrome is my desktop default I can't use modern IE whatsoever. How does this help, Microsoft? I get it, Microsoft. You want SkyDrive to serve as the beating, cloud-connected heart of the Windows 8.1 experience: "Windows everywhere" and all that. But the world's not quite ready to spend all its time in the sky—especially in the wake of the NSA scandal. A modern-style file explorer app would save touchscreen Windows users, including all Windows RT users, from having to suffer the tedium of pecking through the desktop file explorer. Windows 8.1's overhauled modern PC Settings bake in more finger-friendliness for the people who have bought into Microsoft's touchscreen future. A modern file explorer would be the cherry on top. 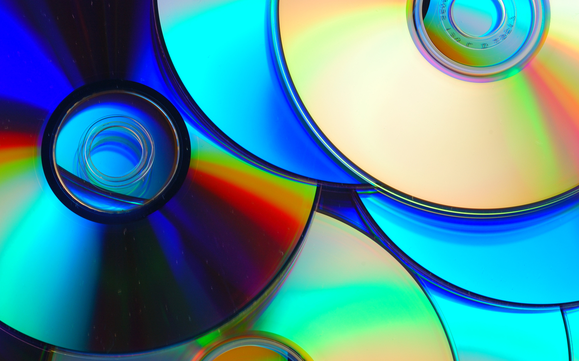 Though Windows 8.1 Preview ships with the optional $10 Media Center pack (and its DVD-playing capabilities) installed, Microsoft has still given no indication that the release version will restore the ability to play DVDs. And you can't even install the Media Center pack unless you're running the $200 Windows 8 Pro, which costs $80 more than the vanilla version of Windows 8. The Windows 8.1 preview available Wednesday didn't include Mail or Calendar updates, so we can't be sure what's in store for those apps, which still need some work before they're up to snuff with top-tier communications options. I'm holding out for two big additions: POP mail support in the Mail app, and CalDAV support in the Calendar app so that it plays nice with Google Calendar again. Alas, I'm not optimistic about seeing either. The new super-big and super-small sizes for Start screen tiles is a small tweak that makes a big difference to Windows 8.1's feel, but again, why stop there? The Start screen still feels so locked down. I'd love to be able to rename tiles, or change their icon and background color. Judging by the emails some of you have sent me, I'm not the only one. Another helpful feature would be the ability to group tiles into "stacks" that fan out at a touch or click. Think of them as modern-style folders. You have the ability to name groups of tiles as-is, but these so-called stacks would really help make the Start screen more efficient—and more personal. A demo of the Natural ID touchscreen fingerprint recognition technology. Now I'm just getting a bit ridiculous, to be honest. But hey—Windows 8.1 already gave Microsoft's native biometric support a big shot in the arm, and technology that can read your fingerprint on a touchscreen is out there. It'd be an awesome feature on such a touch-focused OS. Just sayin'. Stardock's ModernMix software in action. If Stardock's superb ModernMix program can run modern apps in desktop Windows, why can't Windows 8.1? There would be no better way to coax diehard desktop fanatics out of their shells than to add this low-pressure functionality that would enable the best of both worlds. Because I'm just not going to shut up about it until there's a native way to see the date and time on the Start screen at a glance without having to do anything extra. I loathe having to open the Charms bar to see the time if I'm on the Start screen. No, seriously: Loathe. But for all my griping, Windows 8.1 truly does a decent job of paving over Windows 8's worst flaws. Will it convince haters to stop worrying and love the Live Tiles? Not at all. But it does make the experience far less jarring than the initial Windows 8 release. Don't take my word for it, though. While the release date for a final version of the update has yet to be announced, you—yes, you—can try out the preview version of Windows 8.1 today, assuming you're the adventurous type who doesn't mind giving prelaunch operating system builds a whirl. Check out our guide to installing the Windows 8.1 preview—but prepare your PC for that OS-level tinkering first.